I am having a serious moment with salads this month. Well, salads and Mexican. To say that I am ready for Spring… okok and Cinco de Mayo too, is an understatement. I was kind of ready mid January, but that’s just typical me. Thankfully spring is finally here and Cinco de Mayo will be here before we know it (hehe a little too excited for Cinco this year!) . 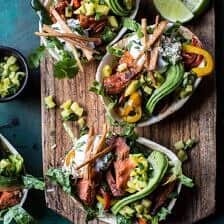 Until then, let’s celebrate spring with this fresh take on salmon fajitas!! These fun little salad boats are the perfect, quick and easy meal for any weeknight. 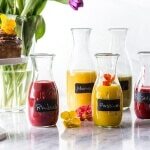 They’re also great for entertaining, think Easter, birthdays, Mother’s Day, and yes obviously – Cinco de Mayo! 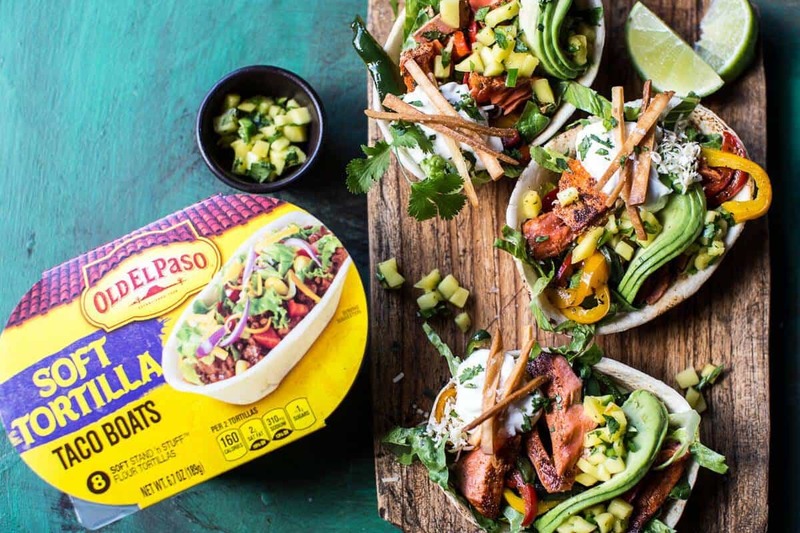 Old El Paso Mini Soft Tortilla Taco Boats make for the perfect edible serving bowl. And you cannot deny, they have a major cuteness factor to them as well! But umm, guys can we just change subject real quick? You remember how I got my wisdom teeth pulled on Saturday and then all week I have been like yeah, yeah I’m fine, that was no big deal. Well, the pain came on strong on Tuesday, and man it was so not fun. I think I got behind on the pain meds (aka Advil) and my mouth just kind of killed all day long. The pain is somewhat manageable though, and I still think I got the good end of the deal when it comes to getting wisdom teeth pulled, but it still hurts a lot, and I’ve got to say I am so glad that this is all done and over with. I am slowly trying to get back to REAL SOLID food. Don’t get me wrong I love yogurt, I love hummus and I love ice cream, but I also really love crunchy, chewy foods. I also never really realized how much you need to chew your food. I can’t tell you how many times I tried some fresh fruit and gave up because it needed to be chewed. UGH. My fruit consumption for the last few days has been only in the form of very finely mashed bananas…still good, but I feel like I’m eating baby food. YIKES. Anyway, hopefully I’m on my way to getting back to eating solid foods soon. Ahh, life will be full again, YES. But guys, let’s talk fun things now. Things like these Salmon Fajita Salad Boats to be exact!! 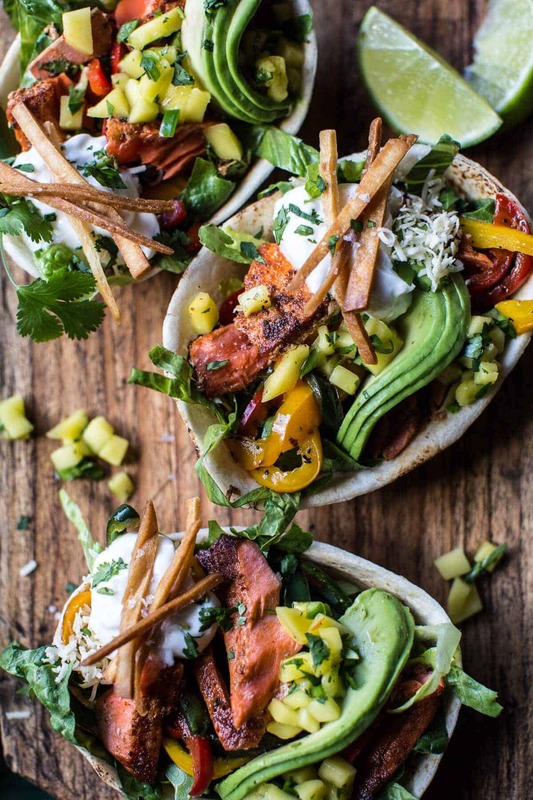 Making these fajita salad boats is simple. 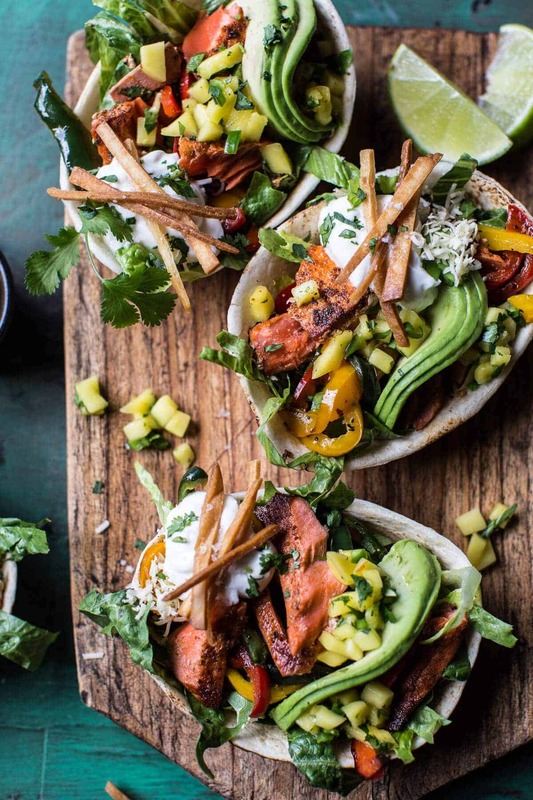 All you’ll need is fresh salmon, peppers, lots of fun salad ingredients and the taco boats. 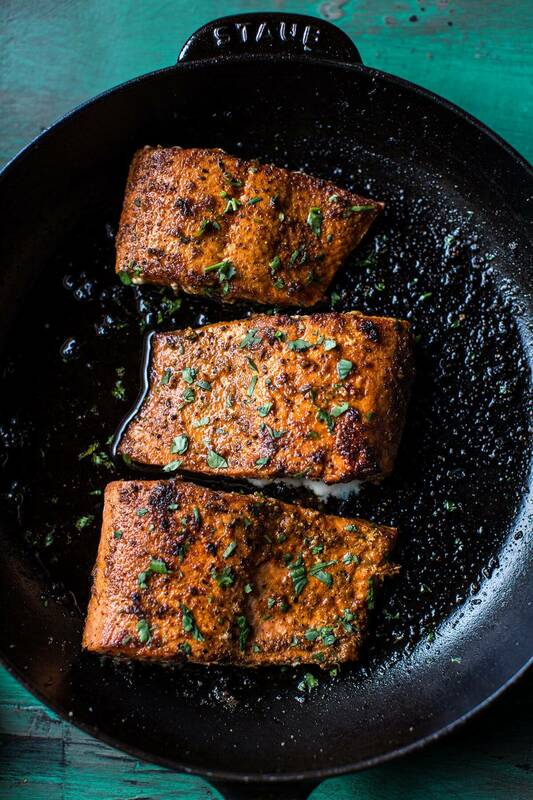 The salmon gets rubbed in a delicious blend of spices and cooked to your liking in a super hot skillet along with some bell and poblano peppers. I also made a quick mango salsa to play up the tropical flavors of the fish. And then, even though it may not be traditional, I added a little cheddar cheese (I mean, when could cheese ever not be a good thing?!?). Once your salmon + peppers are cooked, it’s time to assemble the salad boats!! Lettuce, mango salsa, shredded cheddar, peppers, salmon and sliced avocado. All topped off with a dollop of yogurt and a few tortilla chips if desired. These are great for dinner or entertaining and can be thrown together in just around thirty minutes…. Sooo, what do you think? Is it salad time yet?? Thinking YESS…with a side of pineapple margaritas?!? In a large gallon size zip-top bag or bowl, combine 2 tablespoons olive oil, the chili powder, smoked paprika, cumin, salt, pepper and lime zest + lime juice. Add the salmon and toss to combine. Heat a medium size skillet over medium-high heat. 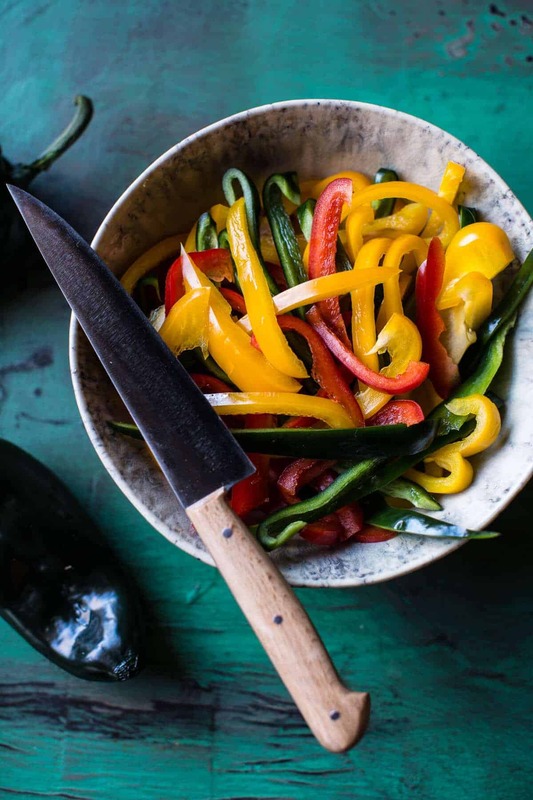 Add a tablespoon of olive oil and once hot, add the red pepper + poblano pepper and a pinch of salt and pepper. Stir fry the peppers for 4-5 minutes. Remove the peppers from the pan. Reduce the heat to medium. Add the salmon, skin side facing up. Sear the salmon for 3-4 minutes and then flip and continue cooking for another 4-5 minutes or until the salmon reaches your desired doneness. Cooking times will vary depending on the size of your salmon. Cut the salmon into 4-6 pieces. In a large bowl, toss together the mango, jalapeno, cilantro lime juice and a pinch of salt. Divide the lettuce among the tortilla boats. Top with the mango salsa and shredded cheddar. Add the peppers, salmon and sliced avocado. Serve with yogurt and tortilla chips if desired. EAT! *This salad is also great when made with chicken. Just swap in 1 pound boneless chicken tenders for the salmon. Follow the recipe as directed. *The salad boats can be assembled a few hours in advance and kept in the fridge until ready to serve. Just before serving, cook the peppers and salmon. 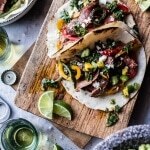 Steak Fajitas with Chimichurri and Cucumber Salsa. This looks waaaay too good!! We were just having a discussion the other day when it’s appropriate to serve cheese with fish, but I’d say this is definitely one of those situations! 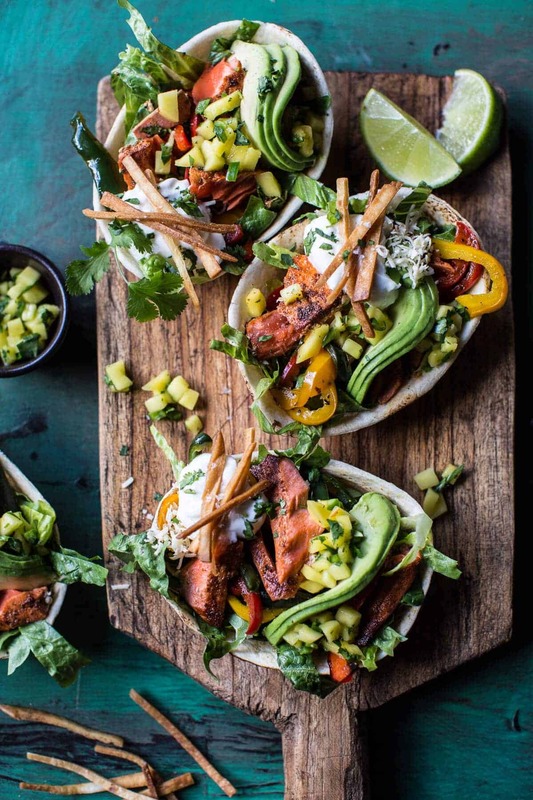 Love fajitas and salmon, so this is definitely a must make for us! It must have been a killer to have to trust others so much with tastes. That is huge! Of all people though mom and dad know best right? These boats looks amazing. I love salmon so yep, I would jump right in to having these for dinner. 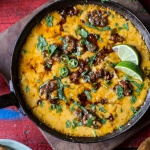 Yay, I’m so excited about Cinco de Mayo foods this year too and this is totally getting me into the mood! I hope your mouth feels better soon and these look crazy delish! I can’t eat fish but I’ll make them with chicken. Spring comes and I start craving salads I never seem to want them in winter. Ahhh these look awesome! I’m always eye-ing those taco boats but never buy them. They’d probably be an awesome holder for a burrito bowl too! Thanks for your constant inspiration! Where is the pineapple margarita recipe 🙂 ? Absolutely loving salmon with fajita spices! Yes, I’m so glad that spring is here! These look so good! The avocado is so pretty! I need these salad boats in my life! What a killer take on fajitas! Writing this after just getting back from doing a root canal myself so yeah, starting to crave something crunchy over here! Great looking pics, can’t wait for Cinco De Mayo neither! That salmon looks so perfectly flavored! Thank you! I am doing good! Thanks and have a great Easter weekend! These look so delicious! I’m going to have to try and make them this weekend. Thanks so much! Hope you love the salad! These look amazing! I’ll definitely be giving these a try. I cannot believe you have survived on Advil alone! Can’t remember how many teeth you had pulled, but man, back when I had all four of my wisdom teeth out, I was definitely reaching for the vicodin. Props to you! LOL. I am OK though and they did give me some stuff, but it’s basically fancy tylenol. Oh well! Thanks and have a great Easter weekend! This looks really good! Hope you feel better really soon! Wisdom teeth removal was horrible for me, glad you are on the recovery side! haha! You amazing! I love that you had a HBH week, YEAHHHH!! Seriously so happy you are enjoying my recipes. THANK! OMG. This looks like everything I want in a summer meal!!!! Thank you Kylie!! I hope you love it when you try!! I made this salmon and mango salsa last night for dinner for myself, instead of making it a salad I just steamed some white rice for the side. So quick and sooo tastey! I will definitely be keeping this recipe in my weekly dinner arsenal. Thanks!! Thanks Nikki! So happy you enjoyed this! I think this is the fifth time I cooked this for my family. Our favourite salmon recipe ever! It’s awesome!! Thank you for sharing your fantastic recipes with us. Wow, thats so awesome! So happy you guys like it, thank you! This salad looks delish..may have to of course Sub a few items..but for sure a keeper. Happy Sunday…and YES……. 🙁 awoke to more snow…. sigh. So happy you like the salad! Snow and more snow.. seems to be the trend! We tried these tonight, followed the recipe down to the letter on all counts. Let it be known that I dislike salmon. A lot. At least, I did until I ate this. Phenomenal recipe, I can’t wait to try others.